Sunday 8 July will be a big day for Europe’s rivers and lakes as tens of thousands of people across Europe will take part in the Big Jump – joining together to demonstrate their love for the continent’s waterways and to call on politicians to protect them by becoming serious about implementing the EU water law, the Water Framework Directive (WFD), for the benefit of people and nature. From Spain to Poland, people will participate in simultaneous events as part of the Big Jump - jumping, diving, wading, kayaking and swimming in streams and ponds, rivers and lakes. WWF offices alone are organising events in more than 11 Member States events. Founded by the European Rivers Network in 2002, the Big Jump has grown into a movement with events being held across the continent. It is easy for anyone to participate – simply go to the Big Jump website to find out where events are taking place or register a new one. The Big Jump is a fun day out for people in places that they love, but it also has a serious political message: Europe's leaders must do more to protect our precious rivers, lakes and wetlands. Across Europe, freshwater ecosystems are deteriorating and species disappearing due to pollution, habitat destruction, fragmentation by dams and excessive use of water. Currently, a mere 40% of European surface waters are considered to be healthy, and EU member states must do more to protect and restore them. Strong legislation is the only way to reverse this trend. Therefore EU Member States must keep to their commitment to sustainably manage, protect and restore freshwater ecosystems as requested by the EU Water Framework Directive. 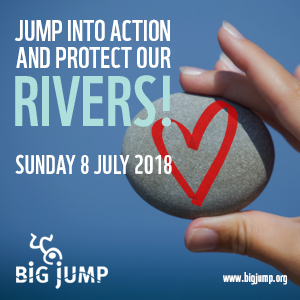 This year’s Big Jump will be bigger than ever with a record number of events, where Europeans will make a splash for our waterways and the laws protecting them, so that people can keep swimming in rivers and lakes in the future. The Big Jump will also be different this year because it is not just about jumping. People across Europe will be showing their love by painting hearts on pebbles and skimming them into their favourite river or lake – as a way of highlighting how much people cherish clean, healthy freshwater ecosystems.